"The road up and the road down are the same thing"
Heraclitus of Ephesus (c. 535 – c. 475 BCE) was a pre-Socratic Greek philosopher, a native of the Greek city Ephesus, Ionia, on the coast of Asia Minor. He was of distinguished parentage. Little is known about his early life and education, but he regarded himself as self-taught and a pioneer of wisdom. From the lonely life he led, and still more from the riddling nature of his philosophy and his stress upon the needless unconsciousness of humankind, he was called "The Obscure" and the "Weeping Philosopher". 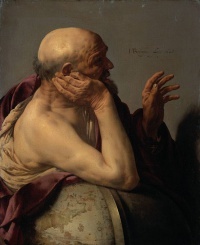 Heraclitus is famous for his insistence on ever-present change in the universe, as stated in the famous saying, "No man ever steps in the same river twice" (see panta rhei). He believed in the unity of opposites, stating that "the path up and down are one and the same", all existing entities being characterized by pairs of contrary properties. His cryptic utterance that "all entities come to be in accordance with this Logos" (literally, "word", "reason", or "account") has been the subject of numerous interpretations. 2 Panta rhei, "everything flows"
"The first of prayers, best known at all the temples, is mostly for riches .... Seeing this then do you not commend the one sage Democritus for laughing ... and the master of the other school Heraclitus for his tears?" Subsequently they were considered an indispensable feature of philosophic landscapes. Montaigne proposed two archetypical views of human affairs based on them, selecting Democritus' for himself. The weeping philosopher makes an appearance in William Shakespeare's The Merchant of Venice. And so on. Πάντα ῥεῖ (panta rhei) "everything flows" either was not spoken by Heraclitus or did not survive as a quotation of his. This famous aphorism used to characterize Heraclitus' thought comes from Simplicius, a neoplatonist, and from Plato's Cratylus. The word rhei (cf. rheology) is the Greek word for "to stream, and to the etymology of Rhea according to Plato's Cratylus." Unless indicated otherwise, the text in this article is either based on Wikipedia article "Heraclitus" or another language Wikipedia page thereof used under the terms of the GNU Free Documentation License; or on original research by Jahsonic and friends. See Art and Popular Culture's copyright notice. This page was last modified 23:04, 23 November 2016.